"Baileys" redirects here. For other uses, see Bailey (disambiguation). Baileys Irish Cream is an Irish whiskey and cream-based liqueur, made by Diageo at Nangor Road, in Dublin, Ireland and in Mallusk, Northern Ireland owned by Gilbeys of Ireland, the trademark is currently owned by Diageo. It has a declared alcohol content of 17% by volume. Baileys Irish Cream was created by Tom Jago of Gilbeys of Ireland, a division of International Distillers & Vintners, as it searched for something to introduce to the international market. The process of finding a product began in 1971 and it was introduced in 1974 as the first Irish cream on the market. The Baileys name was granted permission by John Chesterman after Gilbeys asked to use the name from a restaurant that John Chesterman owned. The fictional R.A. Bailey signature was inspired by the Bailey's Hotel in London, though the registered trademark omits the apostrophe. Baileys is produced in Dublin and Mallusk (Northern Ireland). Cream and Irish whiskey from various distilleries are homogenized to form an emulsion with the aid of an emulsifier containing refined vegetable oil. The process prevents separation of the alcohol and cream during storage. Baileys contains a proprietary cocoa extract recipe giving Baileys its chocolate character and essence. The quantity of other ingredients is not known but they include herbs and sugar. According to the manufacturer, no preservatives are required as the alcohol content preserves the cream. The cream used in the drink comes from Glanbia, an Irish dairy company. Glanbia's Virginia facility in County Cavan produces a range of fat-filled milk powders and fresh cream. It has been the principal cream supplier to Baileys Irish Cream Liqueurs for more than thirty years. At busier times of the year, Glanbia will also supply cream from its Ballyragget facility in Kilkenny. The manufacturer claims Baileys Irish Cream has a shelf life of 24 months and guarantees its taste for two years from the day it was made—opened or unopened, stored in a refrigerator or not—when stored away from direct sunlight at temperatures between 0 and 25 °C (32 and 77 °F). Diageo provides nutritional information for Baileys. As is the case with milk, cream will curdle whenever it comes into contact with a weak acid. Milk and cream contain casein, which coagulates, when mixed with weak acids such as lemon, tonic water, or traces of wine. While this outcome is undesirable in most situations, some cocktails (such as the cement mixer, which consists of a shot of Bailey's mixed with the squeezed juice from a slice of lime) specifically encourage coagulation. In 2003, Bailey & Co. launched Baileys Glide, aimed at the alcopop market. It was discontinued in 2006. In 2005, Baileys launched mint chocolate and crème caramel variants at 17% ABV. They were originally released in UK airports and were subsequently released in the mass markets of the UK, US, Australia and Canada in 2006. In 2008, Baileys, after the success of previous flavour variants, released a coffee variant, followed by a hazelnut flavoured variant in 2010. The company trialled a new premium variety, Baileys Gold, at several European airports in 2009. The Gold version also was marketed towards the Japanese consumer. The latest additions to the Baileys flavour family are Biscotti, launched in 2011, and a sub-brand premium product Baileys Chocolat Luxe, which combined Belgian chocolate with Baileys, in 2013. The company released a Vanilla-Cinnamon variety in the US market in 2013 with further flavours, Pumpkin Spice, Espresso and Salted Caramel launching the following year. In 2017, Baileys launched their Pumpkin Spice flavoured liqueur, also their Vegan Friendly Baileys Almande, and in 2018 Baileys Strawberries & Cream was made available. ^ "FTC Staff Comment Before the Department of the Treasury Alchohol and Tobacco Tax and Trade Bureau Concerning Alcohol Labeling - Federal Trade Commission" (PDF). ^ Clegg, Alicia (2005-08-12). "The Myth of Authenticity". Businessweek.com. Archived from the original on 2008-10-07. Retrieved 2009-04-15. ^ "Irish Food History". Littleshamrocks.com. 1974-11-26. Retrieved 2009-04-15. ^ "Product and Company Information". ^ "Baileys Glide bites the dust — Business support". Morning Advertiser. 2005-08-18. Archived from the original on 2009-01-10. Retrieved 2009-04-15. 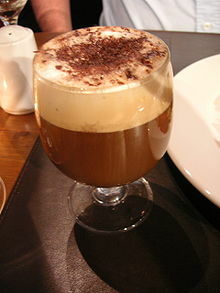 ^ "Baileys With a Hint of Coffee". Thefoodielist.co.uk. 2008-12-23. Archived from the original on 15 October 2009. Retrieved 2009-10-14. ^ "Diageo trials new Baileys in travel-retail". dfnionline.com. Archived from the original on 26 June 2009. Retrieved 2009-06-23. ^ "Baileys Vanilla Cinnamon Irish Cream Launches Stylish Shots on the Go Pop-Up Photo Booths". Wikimedia Commons has media related to Baileys Irish Cream. This page was last edited on 11 April 2019, at 09:52 (UTC).